“If ever there was a modern-day David and Goliath story, this it it. One cold morning in January 1939, residents of southeastern Missouri awoke to a startling sight. 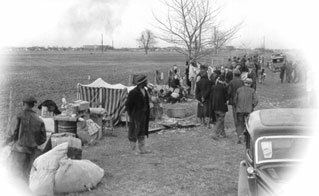 Overnight, more than a thousand sharecroppers–mostly African–American, some white-had appeared alongside two state highways. With them were their families and their few meager belongings. These sharecroppers had left the Missouri Bootheel cotton plantations where they lived and worked to stage this dramatic demonstration. They were protesting a new farm policy, the Agricultural Adjustment Act, that had come from the New Deal administration of President Franklin Roosevelt. A loophole in this policy allowed plantation owners to keep government money they owed the sharecroppers–if they fired their current sharecroppers and hired new ones to take their place. The organizer of the protest was an African-American minister, Rev. Owen Whitfield, a former sharecropper himself and now vice president of the Southern Tenant Farmers’ Union, which was dedicated to creating better conditions for farm workers. Whitfield told the sharecroppers: “Take your eyes out of the sky, because someone is stealing your bread.” He convinced them that this demonstration would draw public attention to their plight. Not all the plantation owners treated sharecroppers unjustly. One planter, Thad Snow, had befriended Owen Whitfield, his wife, Zella, and their large family. He had even helped the Whitfields move into a new government housing project, LaForge, built in the Bootheel in 1937. LaForge was a dream come true for the Whitfields. Like other sharecroppers, they had lived in desperately poor conditions, despite back-breaking labor in the cotton fields. Sharecroppers faced another growing problem. Mechanical cotton pickers, just being developed, would soon make the sharecropping system obsolete. As the sharecroppers put it themselves, they were being “tractored off the land.” Some of them would soon join the “Great Migration,” a stream of people who fled the rural South for the promise of work in northern cities. But, in early January 1939 the protesters along the frigid highways were hungry and cold. The American Red Cross refused to help, calling the protest “a man-made disaster.” Owen Whitfield could not join the demonstrators; he had to flee to St. Louis because of threats against his life. Still, day after day, the sharecroppers remained by the roadsides, huddling in tents. If they were lucky, they had old iron cookstoves to warm them. When Lorenzo Greene, a professor of history at Lincoln University in Jefferson City, Missouri, went to visit the demonstrators in these new camps, He described what he had seen to his classes, students were so moved that they gave up their spring prom and donated the money to help. In St. Louis, activist Fannie Cook also organized a committee of citizens to send relief to the protesters. As months went by, some left the dismal camp sites, but others stayed on; they had nowhere else to go. site, which came to be known as Cropperville. The local sheriff warned them that he could not guarantee their safety in the face of hostility from the surrounding, all-white community. In the end, no bloodshed occurred. Instead, the sharecroppers began tilling the land and building houses. Although there was much hunger and sickness– even some deaths–at the beginning, Cropperville slowly began to take shape, with a school, a church, and community gardens. Within a year, changes brought about by the protest were beginning to be visible. The governor held a conference at which Owen Whitfield, the planters, and officials talked about ways to help the sharecroppers. The federal government also got involved in the Bootheel, agreeing to provide new forms of assistance. Through the Farm Security Administration they created the “Delmo Homes” communities: ten villages in the Bootheel for sharecroppers who needed a place to live. But time went on, and the world began to change. Cropperville residents moved away to fight in World War II or to find better jobs. Finally, Owen Whitfield also moved to take a new church position; ten years after it had begun, Cropperville was all but deserted.